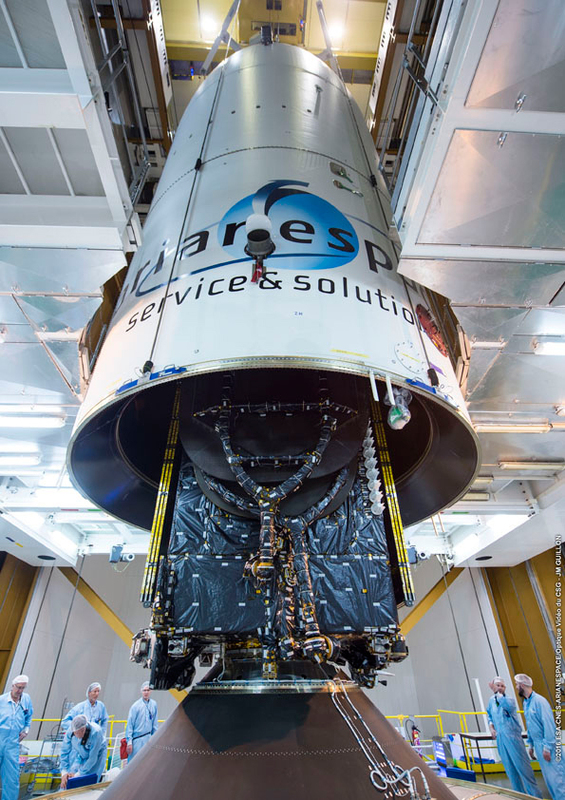 The payload integration process was completed today in French Guiana for Arianespace’s upcoming dual-passenger Ariane 5 Flight VA230 on June 8. The lower passenger for Flight VA230 – BRIsat – is integrated with Ariane 5’s central core inside the Spaceport’s Ariane 5 Final Assembly Building (BAF). 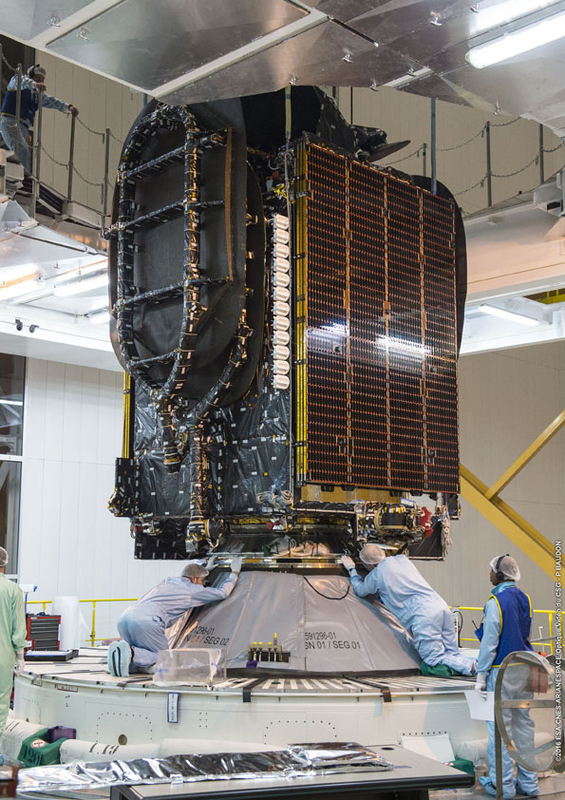 During activity this week inside the Spaceport’s Ariane 5 Final Assembly Building (BAF), both satellite passengers – EchoStar XVIII and BRIsat – have been installed on the heavy-lift vehicle, completing launcher build-up for Flight VA230. These preparations kicked off with installation of the mission’s lower passenger – BRIsat – atop the launcher’s central core. 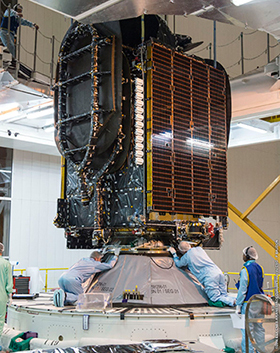 Subsequently, the upper component – consisting of EchoStar XVIII, the SYLDA dispenser system and Ariane 5’s protective payload fairing – was placed over BRIsat. This clears the way for final checkout before Ariane 5’s liftoff next week, including the launch readiness review and the vehicle’s rollout to the ELA-3 launch zone. EchoStar XVIII is the mission’s upper passenger, and it is to be orbited for operator DISH Network L.L.C. The spacecraft features a high-power multi-spot beam in the Ku-band to assure the highest levels of ongoing service to DISH customers in the contiguous United States, Alaska, Hawaii, Puerto Rico and Cuba. Flight VA230’s upper component – composed of EchoStar XVIII, the SYLDA dispenser system and Ariane 5’s protective payload fairing – is lowered over BRIsat to complete launcher build-up for Arianespace’s third heavy-lift mission of 2016. Joining EchoStar XVIII on Arianespace’s next mission is BRIsat – a milestone payload for P.T. Bank Rakyat Indonesia (Persero) Tbk. (BRI). As the world’s first dedicated banking communications satellite, BRIsat will provide enhanced secure banking communications for more than 10,600 operational branches, as well as to some 237,000 electronic channel outlets and nearly 53 million customers across the Indonesian archipelago. Both the BRIsat and EchoStar XVIII relay platforms were built by U.S.-based SSL (Space Systems Loral). Next week’s Ariane 5 Flight VA230 will be Arianespace’s third heavy-lift launch of 2016, following previous successes in January (VA228) and March (VA229). Arianespace is maintaining its busy operational pace this year – with its launch manifest including a record of up to eight Ariane 5 flights, along with its two successful medium-lift Soyuz missions to date (VS14 in April and VS15 in May) and two launches planned with the lightweight Vega.